Relax, savour and enjoy: these words have a special meaning related to our Tuscan house. 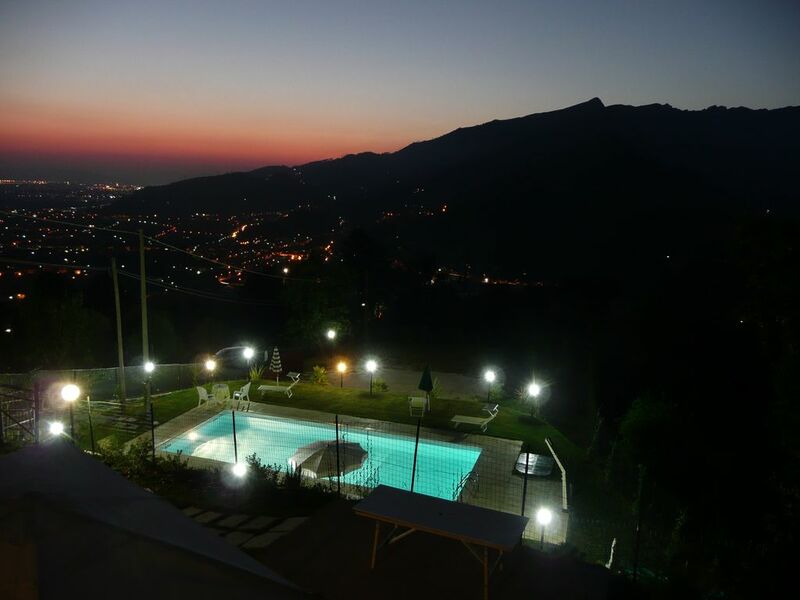 It is situated independently and quietly on the top of a hill just 6 km from the renowned sandy beaches of Forte Dei Marmi far away and offers a beautiful view of the Apuan Alps, of the Tyrrhenian sea and of the romantic, near islands of the Ligurian Gulf of poets. The parking area is very large and with two shady parks. The house has got a swimming pool with shower and panoramic view (approx: 11 x 5 m.), which warrants healthy relaxing hours. At complete disposal of the clients are also a video surveillance system activated in all the perimeter of the house, a wood burning oven and a veranda with BBQ, completely equipped for dinners for up to 12 persons. It also has the benefit of a table tennis. Ground floor: a large kitchen and dining room, a small living room with a divan bed; 1air conditioned double room with fireplace + 1shower/ wc. First floor: 1 large air conditioned double room with one en suite bathroom with loo, sink and shower; 1 double room + 1 three bed-room (both with air-conditioning) + 1 shower and WC room. We stayed in this property for two weeks in August with a party of four adults and three little kids (age 0-3). The house is spacious and offered individual bathrooms for every party. The style of the house is not the latest style, neither very luxurious, but absolutely okay for a nice stay and bathrooms have been renovated. The owner is a very kind man, who took care of anything we requested. Thank you very much, Alfredo! Also very pleasant to work with is Sonja, who is the first contact person for renters (she also is fluent in German). The best thing about the house however is the large pool area, which offers great views all around the coastline, as well as to the mountains. Same views by the way can be enjoyed from the large terrasse and the first floor of the house. We enjoyed our holidays! We spent very good holidays in this house , we were 3 families. You cannot find by yourself the road as it is on small roads on the top of a hill but the view both by day and night is really worth it (with the coast and the mountains). We could enjoy the pool as Well as the touristic cities around (Lucca, Firenze, Pisa cinqueterre ). The bedrooms have air conditioning and there are 3 bathrooms so it was perfect. You just have to have in mind that there is no wifi (but good telecom network ) and that the road is hilly and narrow for the last 10mn so on our side we were not going out often at night. Frau Dr. Domenici hat uns wirklich perfekt betreut. Dank der 4G LTE WiFi-Box, die sie uns noch besorgt hat, konnten 8 kontinuierliche Smartphone-User ihrer Wisch-Kasterl-Sucht auch abseits der Zivilisation mit Blick aufs Meer im Urlaub frönen. Bettwäsche und reichlich Handtücher waren vorhanden. Der Pool ist einfach Spitze und wurde ausgiebig von uns genutzt. Der Besitzer Alfonso ist rührend und hat sich um alles gekümmert. Nach einem heftigen Gewitter mit Stromausfall schaffte er es sogar am Sonntag einen Elektriker zur Behebung des Problems aufzutreiben. Fahranfänger dürften allerdings bei der 10 Minütigen Anfahrt erheblich ins Schwitzen kommen. Das Domizil ist für eine große Familie, die unter sich bleiben will, auf alle Fälle zu empfehlen. Super nette Gastgeber Sonia und Alfredo. Ich hoffe, Sie sind gut zurueck gekommen und dass die Kinder ohne Trauma die Schule wieder angefangen haben! Vielen, vielen Dank fuer Ihre Zeit bei uns! Wir hoffen sehr, dass Sie bald wiederkommen. Wir (drei Familien mit insgesamt vier Kindern) durften zwei Wochen lang in der Villa Paradiso einen sehr schönen Urlaub verbringen. Das Haus ist rustikal, aber sehr gepflegt und sauber. Die Anfahrt gestaltet sich etwas abenteuerlich, wenn man einmal oben angekommen ist kann man den Blick auf Meer und Berge von der großzügigen Terrasse genießen. Durch den Nordhang ist es im Hochsommer auch nicht ganz so heiß. Am besten fanden wir den Pool, welcher durch einen kleinen Weg verbunden im unteren Teil des Gartens liegt. Kleine Kinder kommen so nicht unbemerkt ins Wasser. Auch Pizzaofen, Grill und v.a. die Tischtennisplatte waren bei uns sehr beliebt. Der Ortskern von Pietresanta liegt ca. zehn Autominuten entfernt, zum Meer sind es ca. 15 Minuten. Die Lage eignet sich gut für (Halb-)Tagesausflüge nach Lucca, Pisa, Cinque Terre oder Florenz. Sonia und Hauseigentümer Alfredo waren sehr hilfsbereit und haben uns gute Ausflugs- und Essenstipps gegeben. Vielen Dank nochmal! La Toscane est magnifique et la villa tout confort ! Spacieuse! Tout confort ! Une vue magnifique ! Grande piscine chaude ! Terrasse couverte avec 2 salons ! A 30mn de Pise et Lucca ! Pietrasanta est un très beau village ! Seuls points négatifs les moustiques et bien lire le contrat car il faut payer l électricité a la fin du séjour ! Décoration vieillotte mais ce n est pas grave le restant est top ! The Versilia is a small region located in northern Tuscany, whose name derives from the river Versilia, which flows from the Apuan Alps until the sea, through the municipal districts of Stazzema, Seravezza, Forte Dei Marmi and Pietrasanta. It is well known for its fine sandy beaches covering over 20 Km. Loved by the sculptors Henry Moore, Mitoraj, Botero and many more, the charming, medieval town of Pietrasanta is a renowned international centre for artists working in marble and bronze. Around the Cathedral square there are several coffee-houses and restaurants, where you can taste the local cuisine. Forte Dei marmi is loved by tourists from all over the world who spend their holidays in magnificent villas surrounded by luxuriant vegetation, enjoying the sun and the shopping in the several designer boutiques. The weekly market held on Wednesdays in the town centre is famous all over Italy for quality and fair price. Florence 100 km. Pisa 40 km. Lucca 28 km. Le Cinque Terre 45 km. bed and bath linen (the following items: 2 towels plus a larger one for each person + tea clothes), are not included but can be furnished on request at Euro 12 per person and change . Not included are also heating and electricity, which have to be paid cash according to the amount consumed.